Digital district guide - with everything that older people need! Many digital city guides and maps are available nowadays. But very rarely do they have the information that older people are looking for: Where can I go for a nice walk? Where are benches, where are toilets? For Bremen-Osterholz there is now a digital city district guide, which is tailored to the interests and needs of older people. Senior citizens have participated in the development. Where to go for a nice walk, where to find benches, where are places for meetings or counselling? Together with older people, researchers at the University of Bremen have developed a digital city district guide for Osterholz. Developing a website over 70 years old? No problem. Eleven senior citizens from Bremen have published a digital city guide together with researchers. 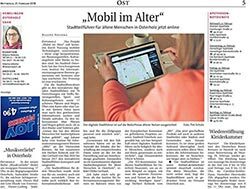 Mobile Age gets more visibility in Bremen as a news article was published on February 21st, 2018 in the "Weserreport Ost" newspaper. It mentions that together with older adults in the district an online guide has been developed. The project is financed by the EU and the aim is to show how older adults can participate in development processes. 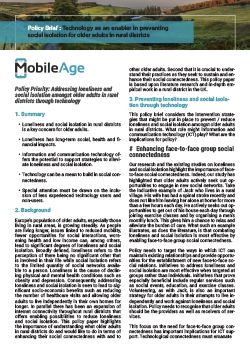 Niall Hayes, Professor in Lancaster University and Mobile Age Project Coordinator, distributed the policy brief on loneliness and social isolation in rural districts at a workshop hosted by the Department for Environment, Food and Rural Affairs and the Cabinet Office in London on 7th February 2018. Digital district guide for Bremen Osterholz available online! 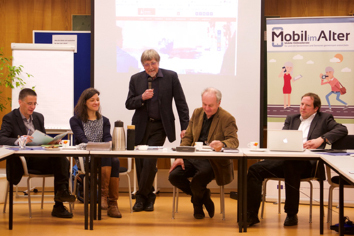 From May 2016 to February 2017 Mobile Age partner from Bremen Germany, ifib, worked together with a group of 11 older adults from the district Osterholz to develop a concept for the digital district guide and implement it as a prototype. On Friday 9th of February 2018, our digital district guide developed in Bremen Osterholz was officially launched on the official city portal Bremen.de. 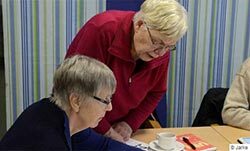 As part of the Mobile Age project we worked together with a group of 11 older adults from the district Osterholz from May 2016 to February 2017 to develop a concept for the digital district guide and implement it as a prototype. The result is a map based district guide with information on 17 beautiful places and paths as well as more than 70 institutions from the fields of culture, sports, meeting and counselling. The result of our work has now been migrated to the official city portal of Bremen. You will find the district guide under the following link: www.bremen.de/osterholz/senioren. Such a sustainable adoption of project results is not a matter of course and we are pleased that the results of our work are still accessible and supported after the end of the project.